I wanted to let my clients and friends know ahead of time that I have Pat Kuleto's listing coming onto the market. The floating home, he calls Lillypad, is where he began building his award-winning restaurant dynasty. Located at 2350 Marinship Way #3, Sausalito, this three-level, 3 bedroom / 2 bathroom home designed by Pat, incorporates his legendary charm, provides ample living space and is in a prime spot to spend your days taking in the gorgeous views of Angel Island, Sausalito Harbor and hills, Mt. Tamalpais and San Francisco Bay. Enter this light and bright home, and you'll immediately appreciate the Koa wood wainscoting and finishes throughout. Enjoy Mt. Tamalpais and the passing yachts as you dine by the floor-to-ceiling bay windows in the dining area--all crafted by Bernard Espinet, who did the wood-work at many of Pat Kuleto's restaurants. Entertain in the living room, complete with an arched, mahogany beam ceiling reminiscent of a boat's hull, and a wood-burning fireplace. Or enjoy your favorite libation at the full bar and kitchen, complete with gas appliances and granite counters. Retire to the large deck off the master suite for a breath of sea air and some relaxation. Then wake up and do it all over again by starting the day in the custom shower with special, curved shatter-proof glass walls to take in the same great views, and mosaic tile floor, designed by the artist who did the tile work at Boulevard. Property features include a custom iron spiral staircase and fireplace in the master suite with a beautifully-sculpted ocean motif, designed by Toby Hickman, whose work is throughout Farallon and Boulevard. The master suite also boasts a wet bar with mini fridge, panoramic view, and a one-of-a-kind octopus, hanging light fixture designed by Pat and created by George Lucas' Industrial Light & Magic. The cement hull was built by Forbes Kiddo, the master barge-maker, and owner of Forbes Island. Landscaped with drip irrigation system. Extra barge. Electronic security gate, and uncovered parking for two in the Marina's lot, are also included. 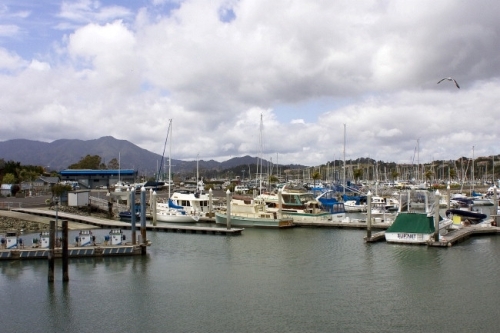 2350 Marinship way #3 is in the desirable Sausalito Shipyard and Marina, formerly known as Arques Marina. This exclusive location has only four other floating homes, and is close to Mollie Stone's Markets, the post office, FedEx, banks and downtown Sausalito, as well as public transportation. Offered at $495,000. Contact Jonathan B. Jacobs, Realtor 415-264-6655 for showings.